Village Quilt Done! – It's a T-Sweets day! 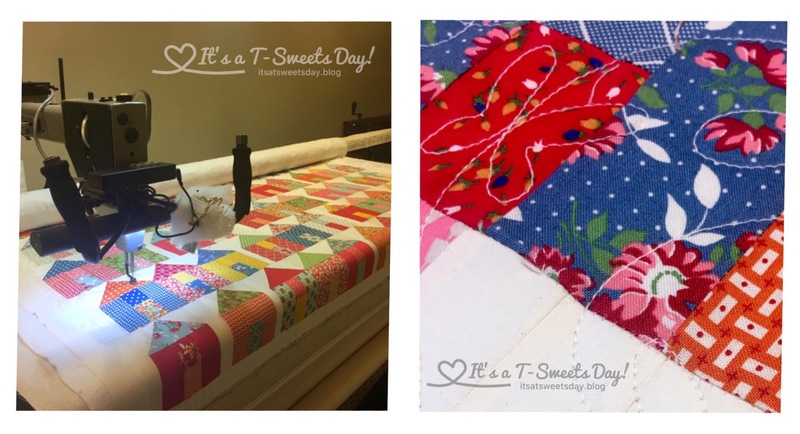 Published on October 23, 2017 January 3, 2018 by Tracy @ It's a T-Sweets Day! 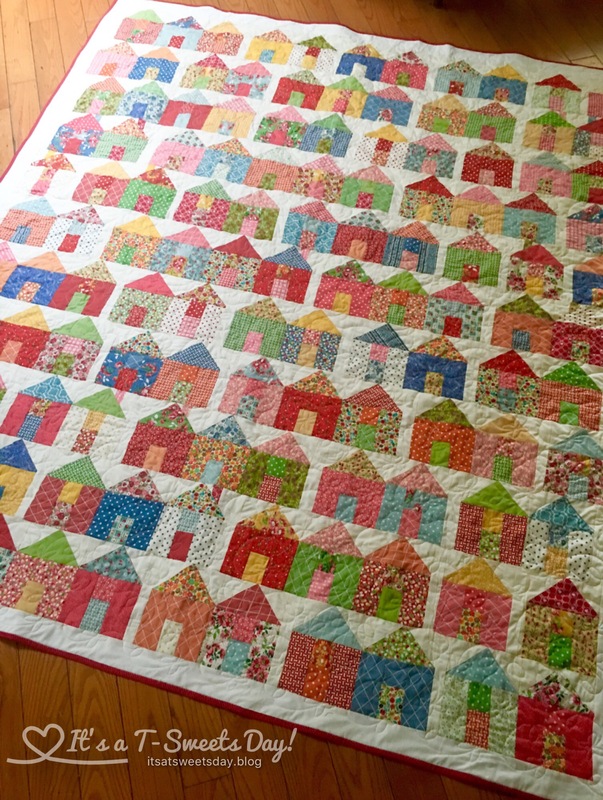 I am so happy to say that my Village Quilt by Miss Rosie’s Quilt Co. is finally finished:). Yea yea! Happy dance!! It is hard to believe that this simple little quilt has taken me over a year to finish. Really?! It just seemed like there was always some other project that was more important. And then when I did start working on it, there would be a problem and I would have to put it back in the box to clear my head a bit. 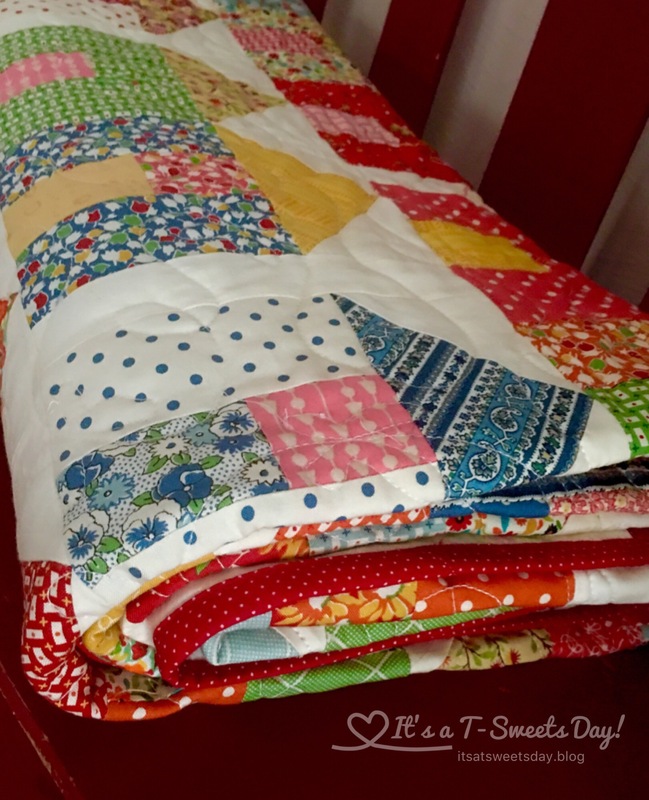 That is what happened the last time I blogged about this quilt. I had pieced everything together and the top was 2 1/2” smaller than the bottom. I’m glad I wrote myself a note because this time, when I took it out, I knew right where to put my efforts. It really wasn’t hard to fix when my head was clear and I wasn’t frustrated. I just used my handy seam ripper and unsewed a bit. It was fine. 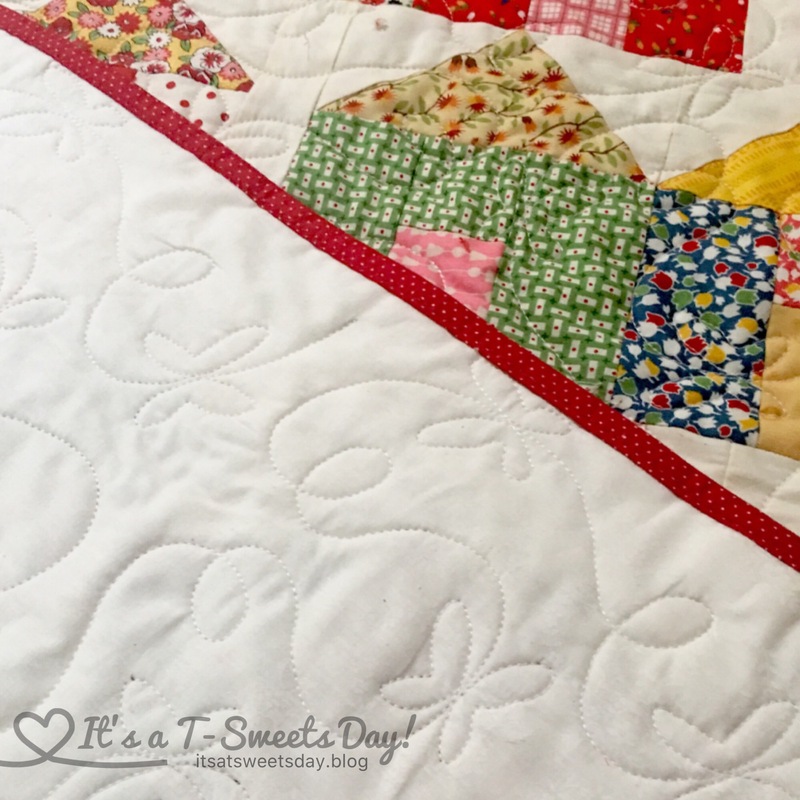 Quilting candy is the best kind of candy because the SWEETNESS is all calorie free! This is my first finish for the Q4FAL. Woo hoo! I love it, it’s so bright and colourful! It reminds me of pictures you see of rows of little houses on a hillside. And now I want to make one. It’s a fun one to be sure! Ball the red makes this such a cheery quilt, and the butterfly pay to is a perfect complement to it. How satisfying to have a long term UFO out of the box and finished! Hurray for you! I love this quilt!. Now I feel Like I need to do one.. Argh……The list gets longer. I know what you mean! I want to make all of the beautiful things I see made by my quilty friends like you:)! 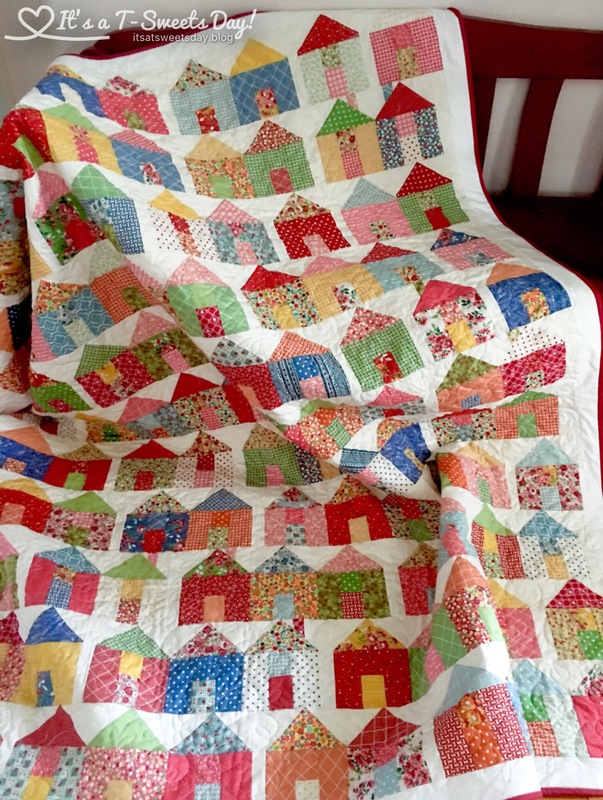 Love all those cheerful, bright vintage style fabrics 🙂 It’s definitely a “makes me happy” quilt! Smiles and more happy smiles for sure! Beautiful. Sometimes when a project frustrates you, it’s best to put it down until you’re ready to tackle it! Just absolutely gorgeous! I would love to do a wall hanging version of this quilt. 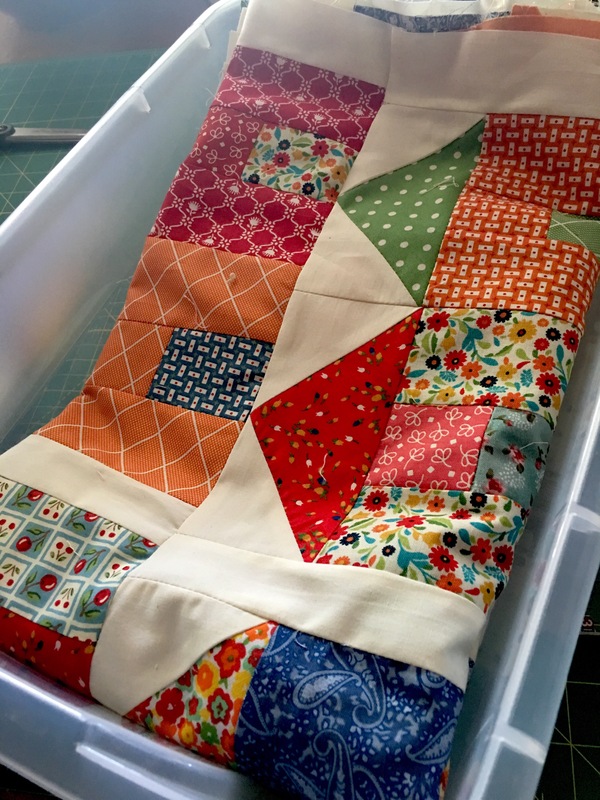 I would like to ask, how did you fix your 2 1/2″ difference in the quilt. I have those things happen to me, as well. Thank you Cindy! It does feel nice to get it done. Now on to the next great adventure:)! What a cheery quilt! The butterflies are perfect for your design. 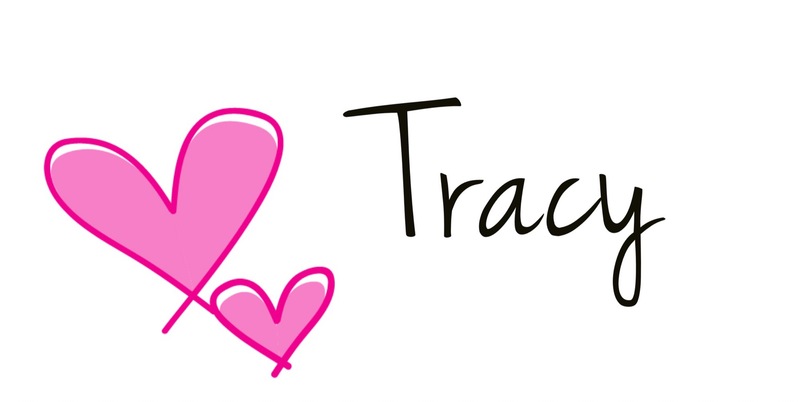 It’s beautiful Tracy! The quilting looks amazing as always! What a gorgeous, quilt!! Love the colors and fabrics. I, too, love the quilt. What size are the blocks? 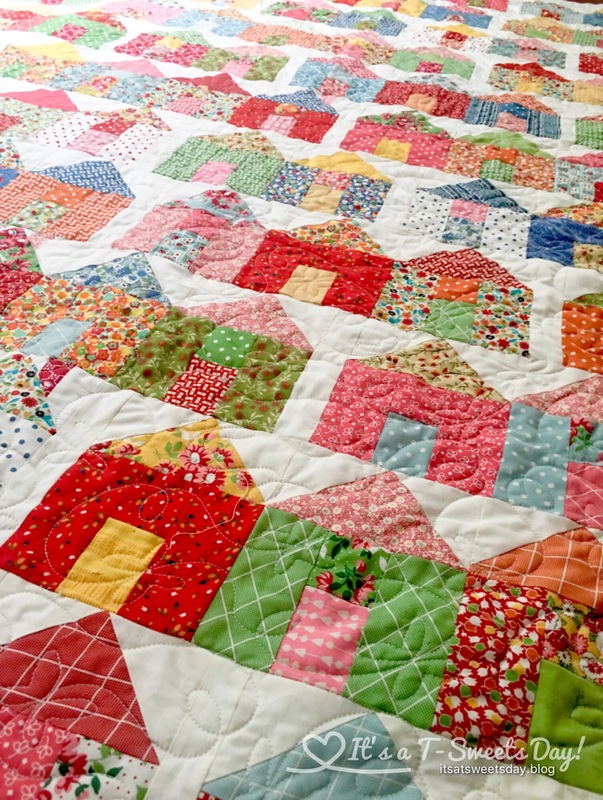 Oh my goodness, what a beautiful, bright quilt – the butterflies are perfect! On behalf of the global hosts of the Finish A Long, thank you for participating! Thank you so much for dropping by Felicity! I am so glad to be part of the fun! Tracy, I adore your quilt! Your fabric choices are great and so is the quilting.